SUMMARY: While back pain presents less frequently in children than in adults, it still poses a significant clinical challenge with respect to making a firm diagnosis and developing an effective treatment plan. When children have back pain and medical attention is sought, an underlying pathology is usually suspected. Pediatric patients are evaluated, first, with a complete clinical history and examination and, second, by an imaging work-up that is based on initial findings, including the child's age and size, signs and symptoms, and suspected etiology. This article describes 1) the epidemiology of back pain in children, 2) the imaging work-up used, and 3) the correlation of imaging findings with disease entities that may cause back pain in the pediatric patient. The list of diseases giving rise to back pain is not meant to be exhaustive but rather reflective of the most commonly identified pathologies and disorders among young children and adolescents, from athletic injuries to lethal cancers. This review article covers the epidemiology, clinical evaluation, imaging work-up, and imaging findings of entities causing back pain in children. The prevalence of back pain in children and adolescents varies widely from 12% to 50%. Jones et al8 reported an average lifetime prevalence of back pain of 40.2% in 500 children between 10 and 16 years of age. Burton et al12 demonstrated a lifetime prevalence increase from 12% at 11 years of age to 50% at 15 years of age. A cross-sectional study performed in a Danish population showed a dramatic increase in the prevalence of low back pain in the early teen years.9 Sato et al4 recently reported a lifetime prevalence of 28.8% in Japanese children, increasing to 42.5% in junior high school. By 18 years of age in girls and 20 years of age in boys, Leboeuf-Yde and Kyvik13 demonstrated that >50% of these children had experienced at least 1 episode of low back pain. Back pain in children is often the manifestation of a benign process; in some cases, however, it may suggest a serious pathology such as a neoplasm or an infectious process. Unfortunately, organic pathology (benign or malignant) is not always identifiable; this problem, in turn, frequently leads to extensive diagnostic work-ups in children described as having nonspecific or mechanical back pain.17,19 In a recent prospective study, Bhatia et al17 examined the rate of pediatric back pain diagnosed and the value of the various tests used in making diagnoses. In this study, 78% of patients had no definitive final diagnosis, including those with disorders that might have been treatable but were not identified. Similarly, Auerbach et al19 found a high prevalence of mechanical back pain (53%) with negative findings on radiographs, SPECT, CT, and MR imaging. The clinician should recognize symptoms and signs that may represent serious pathology and may warrant further urgent investigation (Table 1).15 “Red flags” in the history include pain in prepubertal children, especially <5 years of age; acute trauma; progression of symptoms with time; functional disability; pain lasting >4 weeks; history of malignancy or tuberculosis exposure; recurrent or worsening pain; early morning stiffness and/or gelling; night pain that prevents or disrupts sleep; radicular pain; fever; weight loss; malaise; postural changes (eg, kyphosis or scoliosis); and limp or altered gait. Red flags in the physical examination include fever, tachycardia, weight loss, bruising, lymphadenopathy or abdominal mass, altered spine shape or mobility, vertebral or intervertebral tenderness, limp or altered gait, abnormal neurologic symptoms, and bladder or bowel dysfunction.11,15,18,23,27,28 In a study by Feldman et al,11 the correlation between the type and location of pain, scoliosis, and an abnormal neurologic examination was evaluated for its predictive value in making a specific diagnosis. Their results showed that when both radicular pain and abnormal findings on a neurologic examination were present, the specificity and positive predictive value of making a specific diagnosis were 100%. Night pain also had a very high specificity (95%) for determining a specific diagnosis. Lumbar back pain was the most sensitive (67%) and had the largest negative predictive value (75%) of the variables identified. Spine radiography may not be recommended initially in patients who have had benign findings on physical and neurologic examination and whose symptoms are of short duration.18 When indicated, radiographs are a good initial diagnostic tool for the evaluation of back pain in children and should include both anteroposterior and lateral views of the spine. Collimation to the precise area of interest often helps. Oblique views are not routinely obtained in children, however, in part because of concerns regarding exposure to radiation and in part because subtle fractures are often missed on radiography. In the recent study by Feldman et al,11 plain radiography demonstrated a high diagnostic yield. Among patients who had a specific diagnosis in his study, 68% were diagnosed by plain radiographs. After plain radiography, the imaging technique best suited for imaging back pain in children is subject to debate. The clinician must be especially mindful of the amount of radiation exposure associated with each diagnostic technique—an important consideration in imaging children. The use of CT in children, for example, has increased significantly in the past 2 decades. Although CT is an excellent diagnostic tool, there is some evidence that repeated scanning (and associated ionizing radiation) may place some children at risk for fatal cancers. The principles of ALARA should be applied to reduce radiation exposure.29 As a rule, the use of CT in children should be kept to a minimum, and when indicated, imaging should be restricted to the smallest FOV necessary.30 When possible, imaging modalities that do not emit ionizing radiation, such as MR imaging, should be used in the pediatric population. In the setting of persistent back pain with negative findings on plain radiographs, 99mTc-MDP SPECT has been the criterion standard. However, the use of 18F with PET has been shown recently to provide exquisite detail.31 Radionuclide imaging can detect abnormalities (eg, spondylolysis, stress fractures)32 or bone lesions (eg, osteoid osteoma). In a study by Auerbach et al, 19 negative findings on a SPECT scan were 100% predictive of MBP in patients with <6 weeks of pain. MBP was diagnosed when there was no demonstrable cause of back pain and findings on all imaging studies (SPECT, CT, MR imaging) were negative. Spondylolysis, however, was more often detected by SPECT compared with MR imaging. Achieving an effective radiation dose with SPECT is also of paramount importance, especially in cases in which a fracture requires further CT evaluation and exposes the child to yet more radiation.33 In addition, SPECT may not identify other organic causes of back pain such as bone tumors, soft-tissue tumors, or soft-tissue infections. Until recently at our institution, back pain in the young athlete has been evaluated by a SPECT bone scan followed by CT of the affected area. These patients are now evaluated by MR imaging, and in cases in which there is some evidence of spondylolysis, the extent of healing is assessed by follow-up CT for up to 4 months following the initial diagnosis. 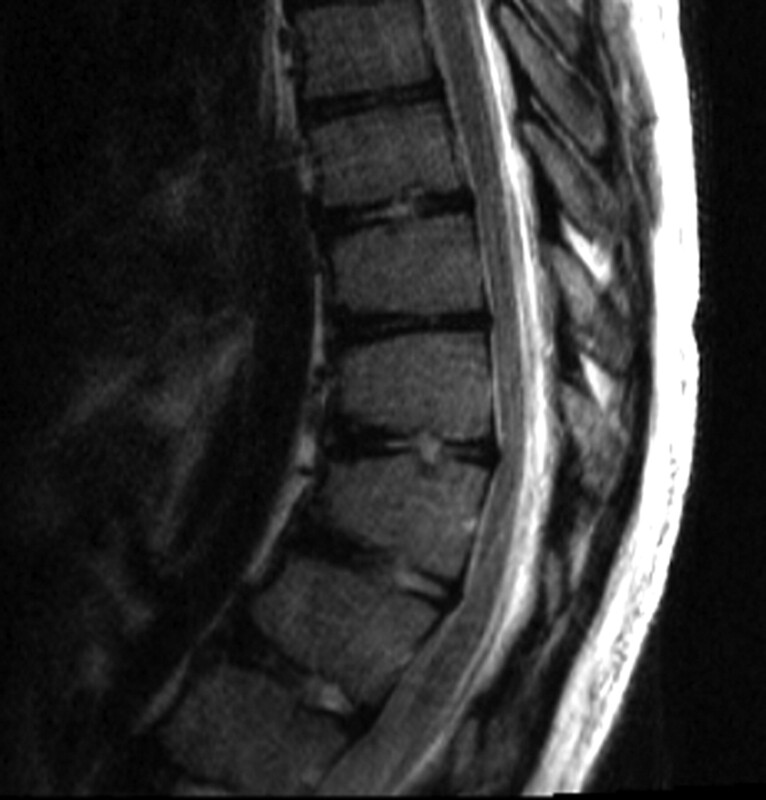 This approach has recently been explored by Dunn et al,33 who concluded that MR imaging should be used as the first-line imaging technique for evaluating adolescents with back pain, specifically when acute spondylolysis is suspected, because the presence of marrow edema is detected with great clarity on both sagittal STIR and fat-saturated T2 images. CT is widely accepted as the criterion standard for the evaluation of osseous structures, and it is considered the imaging technique of choice for characterizing fractures, monitoring healing, and detecting progression.23,33 CT alone fails, however, to detect early stress reaction and other relevant spinal abnormalities. In such cases, helical imaging is performed through the area of interest followed by 2D reconstruction of the images generated with this technique. 3D reconstruction models have become increasingly important in the preoperative evaluation of spinal trauma and scoliosis and in presurgical orthopedic planning. MR imaging is the technique of choice in diagnosing intraspinal or paraspinal pathology, especially in younger children whose clinical histories and physical examinations are characterized by the several red flags mentioned previously. Indeed, increasing numbers of institutions use MR imaging as the first-line imaging technique when serious underlying pathology is suspected in a child with back pain.15 MR imaging is useful in evaluating soft tissue, bone marrow, and intraspinal contents, including disk disease, spinal tumors, infection, and congenital anomalies. More recently, it has been favored for evaluating bone marrow edema (evident, for example, in stress fractures) or for assessing spondylolysis.33 On the basis of the suspected underlying abnormality, the examination is tailored accordingly. In all cases, the decision to use MR imaging must be weighed carefully against the relatively high cost of this type of study, the need to sedate younger children before and during a given examination, and the potential for adverse reactions to anesthesia and/or side effects arising from its administration. In the sections that follow, imaging sequences are presented as they relate to specific conditions associated with back pain. Some of the common etiologies of back pain are described in the sections below. This discussion is not meant to be exhaustive and is summarized in Table 2. 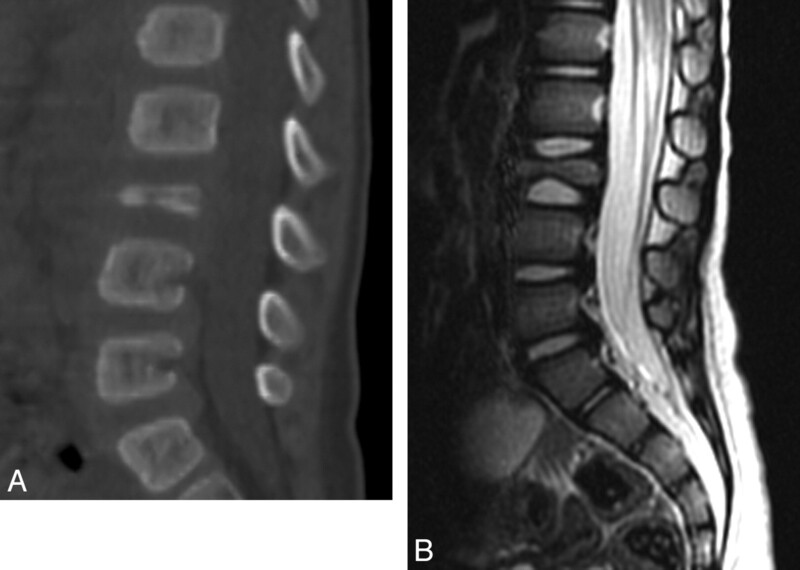 There is no general consensus for the imaging evaluation in suspected cases of spondylolysis. As previously mentioned, until recently at our institution, bone scans have been initially obtained, followed by CT of the affected area. MR imaging is now performed initially; in cases in which spondylosis is confirmed, a follow-up CT to assess healing may be performed for up to 4 months following the initial diagnosis. However, if the findings of the MR imaging study are initially negative and if the patient continues in pain with no response to physical therapy, then the physician may order a bone scan (SPECT). The diagnostic imaging work-up for suspected spondylolysis is typically initiated with plain radiographs. 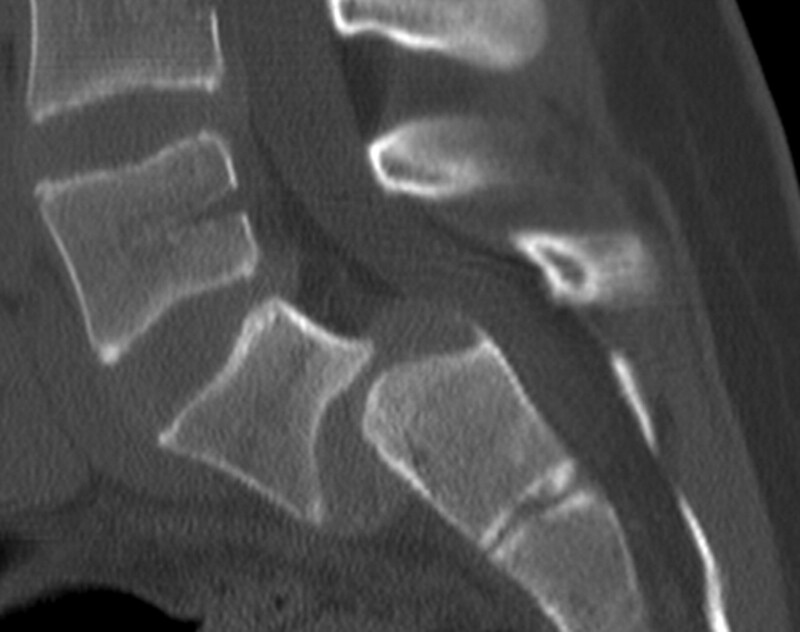 Although this technique has a low sensitivity for detecting spondylolysis, it can detect spondylolisthesis, which, in the presence of bilateral pars defects, is characterized by the anterior slippage of a given vertebra over the one below it.42 The amount of slippage is graded by measuring the degree of displacement of the vertebral body relative to the inferior vertebral body. Grade 1 represents <25% displacement; grade 2, 25%–50% displacement; grade 3, 50%–75% displacement; and grade 4, 75%–100% displacement. Grade 5 (spondyloptosis) refers to complete displacement of the vertebral body anteriorly, with inferior displacement to the level of the vertebral body below (Fig 1). On oblique plain films of the lumbar spine, a lucency can be seen in the pars interarticularis. In addition, ipsilateral pedicle hypertrophy and/or sclerosis can be present. An oblique lucency at the base of the laminae may be seen on the lateral view. SPECT bone scans are very sensitive for detecting spondylolysis, revealing areas of bone turnover; and the findings are generally positive for a prolonged period.19 On SPECT, spondylolysis will present as increased radiotracer uptake in the posterior elements (the pars interarticularis, lamina, or pedicle) (Fig 2A). These findings may suggest stress reaction, stress fracture, or a symptomatic spondylolytic defect. CT scans have been considered the criterion standard for characterizing fractures and for detailing bone morphology and anatomy.33,43 The CT technique consists of a limited helical scan (3-mm section thickness with reconstruction to 0.75 mm) from the pedicle of the vertebra above to the pedicle of the vertebra below the level or levels of interest. On CT, fractures arising from a stress reaction may present with localized sclerosis without trabecular or cortical disruption. In addition, cortical or trabecular disruption of the pars interarticularis with minimal sclerosis or lysis of the fracture gap may be seen (Fig 2B). Visualization of the pars defect may be aided by sagittal reformations (Fig 2C). MR imaging evaluation of spondylolysis consists of sagittal T1-weighted images and sagittal T2-weighted images with fat saturation (or STIR), axial T1-weighted images, and nonangled axial FSE T2-weighted images with fat saturation (or STIR) of the lumbosacral spine. On MR imaging, a spondylolytic defect with focal decreased signal intensity of the pars interarticularis on sagittal and axial T1-weighted imaging may be present. Incomplete fractures propagate in an inferior-to-superior direction.33 There may be high signal intensity on STIR or T2-weighted fat-saturated MR images, consistent with marrow edema. MR imaging is less useful for demonstrating the healing response of incomplete fractures. 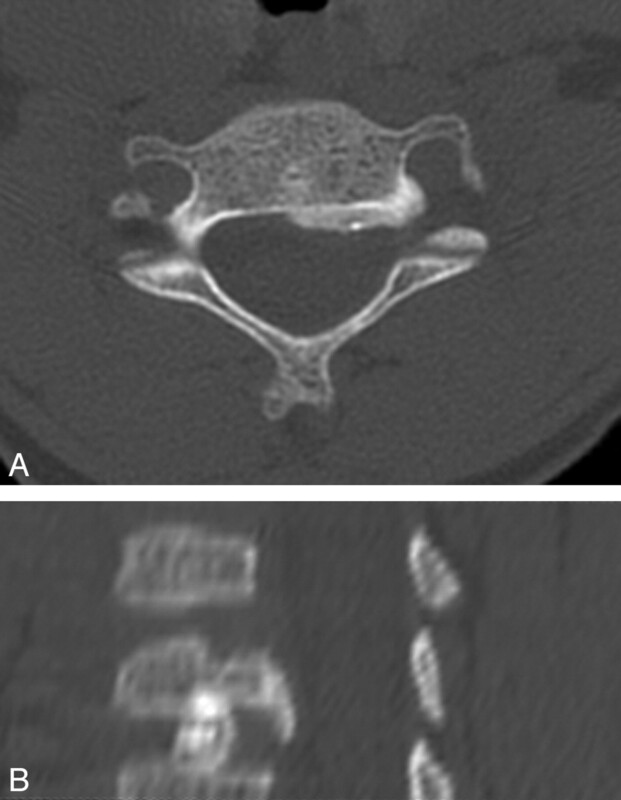 Neither MR imaging nor CT, however, can reliably distinguish whether an incomplete fracture is in an evolutionary or reparative phase.33 Saifuddin and Burnett44 have proposed the following widely used MR imaging classification for spondylolysis: grade 0 (normal): normal marrow, intact cortical margins; grade 1 (stress reaction): marrow edema, intact cortical margins; grade 2 (incomplete fracture): marrow edema, cortical fracture incompletely extending through the pars; grade 3 (complete active fracture): marrow edema and fracture completely extending through the pars (Fig 3A); and grade 4 (fracture nonunion): no marrow edema, fracture completely extending through the pars. The evolution of spondylolysis has been described in 4 stages45: The first stage consists of a stress reaction that is radiologically inapparent but visible on bone scintigraphy and MR imaging.43 The second stage, early spondylolysis, represents a range of features including hairline fractures and bony resorption evident on CT. The third stage represents a complete pars fracture with or without fragmentation—also referred to as progressive spondylolysis (Fig 3B, -C). The fourth stage, referred to as terminal spondylolysis, is characterized by nonunion of the fracture and sclerosis. Thoracolumbar fractures are more common in older children and adolescents, while cervical fractures are more common in younger children. In athletes, acute fractures of the thoracolumbar spine are rare.23 Plain films are useful in assessing the degree of compression of the vertebral body. Compression of <25% indicates stability, with a single anterior column involvement. CT is indicated if the compression approaches 50%, which may be indicative of anterior and middle column involvement. In children, injury may be present without evidence of radiographic abnormality. 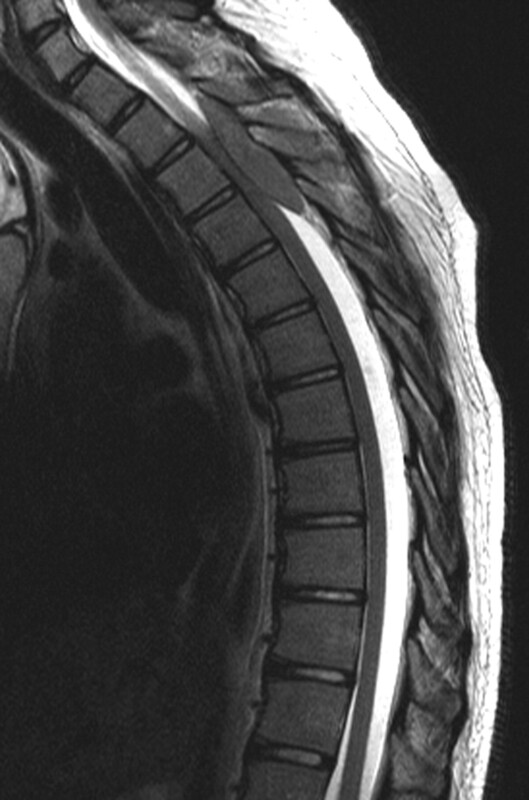 In these situations, diagnosis is often elusive, and MR imaging is indicated for evaluation of intraspinal abnormalities. 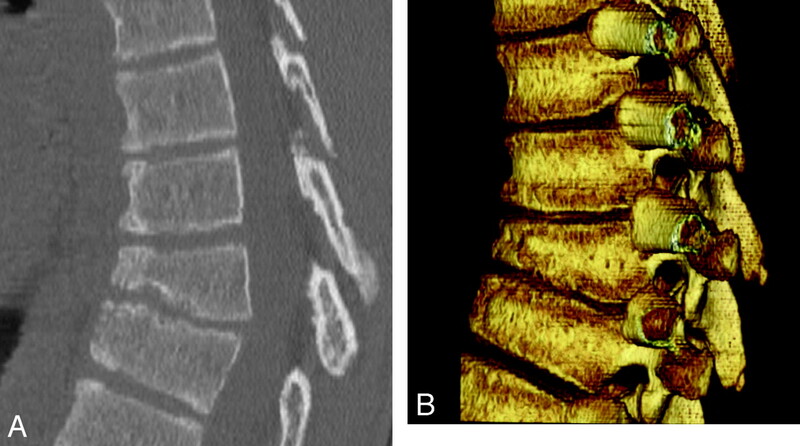 Intervertebral disk degeneration, a fairly common finding in children with low back pain, is seen in approximately 50% of symptomatic patients, compared with 20% in asymptomatic patients.46 MR imaging shows loss of disk height and decreased signal intensity on T2-weighted images. The finding of disk degeneration has no impact on treatment, however. Disk calcification, while often difficult to identify, is usually seen on plain film or CT as an attenuated, round, oval, flattened, or fragmented calcification in the nucleus pulposus (Fig 6). CT or MR imaging may also demonstrate an associated disk herniation. On MR imaging, calcification can appear as decreased signal intensity on T2-weighted images or as hyperintense on T1-weighted images. Diskitis is an inflammatory process or infection of the intervertebral disk. Diskitis has a bimodal distribution occurring in young children between 6 months and 4 years of age, with a second subtler peak from 10 to 14 years of age.61 Although the pathophysiology of diskitis is not entirely understood, it is thought to be related to the presence of vascular channels that terminate in the cartilaginous portion of the disk and disappear later in a life, thus making the disk susceptible to infection. Abundant intraosseous arterial anastomoses during childhood are thought to promote clearance of micro-organisms or entrapped emboli, making the vertebral body less susceptible to infarction from septic emboli.62,63 Most experts attribute the etiology to an infectious process. While findings of radiographs of the spine are usually normal in the early stages of disease, findings of bone scintigraphy can be positive as soon as 1–2 days after the onset of symptoms, demonstrating increased uptake in the intervertebral bodies on each side of the disk involved. However, bone scintigraphy is not specific and cannot differentiate diskitis from other causes of back pain. The earliest time interval between the onset of symptoms and a positive radiograph has been 12 days. In the series of Fernandez et al,60 of 33 children with diskitis, 76% had abnormalities detected on spine radiographs and the most frequent finding was decreased height of the disk space and erosion of adjacent vertebral endplates. MR imaging is the study of choice because it can detect diskitis early on. 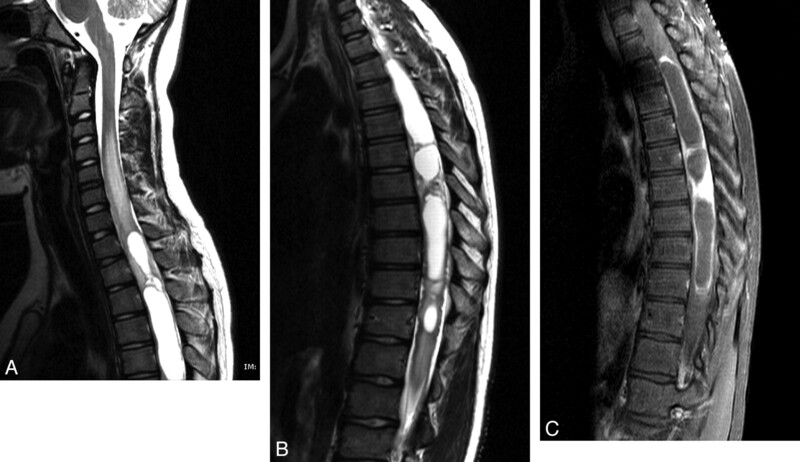 MR imaging findings include loss of the normal hyperintense signal intensity of the disk on T2-weighted images, narrowing or complete absence of the disk, and abnormal increased T2-weighted signal intensity in the adjacent vertebral bodies, consistent with marrow edema (Fig 7A).65 There may be contrast enhancement of the disk and adjacent vertebral body (Fig 7B). 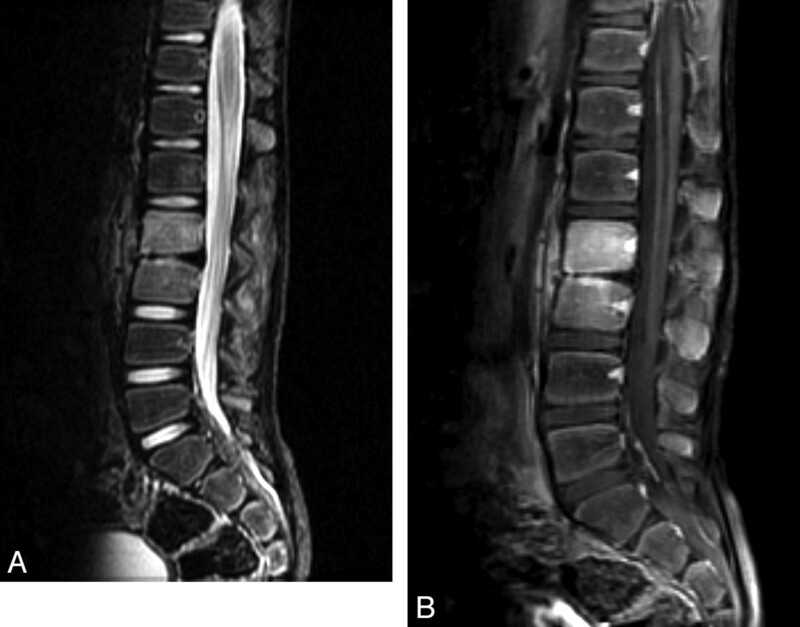 MR imaging detects disk extrusion and the formation of paraspinal and epidural abscesses. Any evaluation for suspected diskitis should exclude spinal cord compression.58,65,66 Follow-up radiographs will show persistent narrowing of the intervertebral disk space and sclerosis at adjacent vertebral bodies weeks or months after the initial diagnosis. Most patients, moreover, will be asymptomatic within 3 weeks following antibiotic treatment, and in such cases, disk space height can sometimes be restored. We will present examples of some of the specific tumors that can be associated with back pain. Osteoid osteoma, a benign osteoblastic lesion of unknown etiology, was first described by Jaffe in 1935.80 This lesion consists of a nidus of osteoid matrix and a stroma of loose vascular connective tissue. The nidus may be calcified and surrounded by sclerotic reactive bone, usually measuring <15 mm. Of all osteoid osteomas, 10% are localized in the spine. Osteoid osteoma is more frequently found in boys; most affected children are 10–12 years of age at the time of diagnosis. When the spine is involved, LCH most frequently presents with local back pain; the thoracic vertebrae is the most commonly affected region (54%), followed by the lumbar spine (35%) and cervical spine (11%). There may be associated leukocytosis and fever. On conventional radiography, LCH can present as a lytic nonsclerotic destructive vertebral lesion; as a vertebra plana (with preserved adjacent disks and posterior elements rarely involved); or as scoliosis, which is far less common. On CT, the nonsclerotic destructive osseous lesion can present with a paraspinal enhancing soft-tissue mass. Epidural extension may occur. 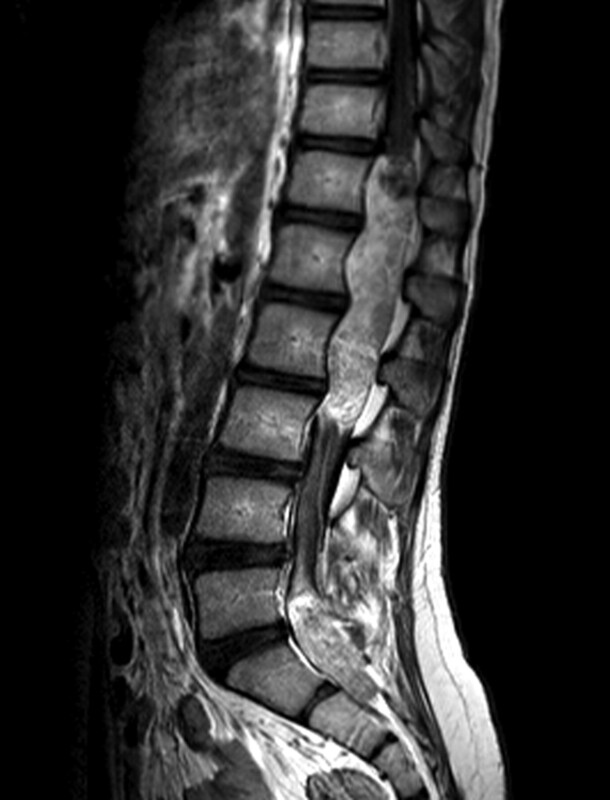 A collapsed vertebra plana is a typical form of presentation (Fig 10A). MR imaging is the technique of choice for staging LCH and monitoring response to therapy.96 LCH may manifest as a homogeneously enhancing soft-tissue mass that is hypointense on T1-weighted images and hyperintense on T2-weighted images, with or without a pathologic fracture. When a vertebra plana is present, the classic appearance is 2 vertebral disks in apposition without an intervening normal vertebral body (Fig 10B). The differential diagnosis for vertebra plana includes histiocytosis; tumors; and infections such as tuberculosis, leukemia, lymphoma, trauma, Gaucher disease, and neurofibromatosis. On conventional radiography and CT, Ewing sarcoma presents as a permeative osteolytic lesion with a “moth-eaten” appearance. An extraosseous noncalcified soft-tissue mass can be present in 50% of cases (Fig 11A). Although CT can differentiate Ewing sarcoma from osteosarcoma by confirming the absence of a tumor matrix, it may also underestimate soft-tissue involvement. MR imaging is an excellent tool for delineating soft-tissue extension and invasion into the spinal canal. Ewing sarcoma appears T1-hypointense to normal bone; and on T2-weighted images, it varies from hypointense to hyperintense. Moderate enhancement of the lesion is present with areas of necrosis (Fig 11B).101 Lymphoma and neuroblastoma can have a similar radiographic appearance. On conventional radiography, occasionally enlargement of the spinal canal or scoliosis is seen. CT may show expansion and remodeling of the bone. Differential diagnoses of intramedullary lesions include ependymoma, ganglioglioma, and hemangioblastoma; autoimmune or inflammatory myelitis (acute transverse myelitis, multiple sclerosis, and infectious myelitis); and vascular diseases such as cord ischemia or infarction. Ependymoma is uncommon in children except in association with neurofibromatosis type 2 and is usually a WHO grade 2 tumor. These tumors are slow-growing, presenting more often in adolescence with a slight male predilection. The origin of ependymomas is presumably from the ependymal cell remnants of the central canal. As a result, the extension of this tumor is circumferential and vertical along the central canal and centrally located in the cord, causing expansion of the gray matter.72,102 On conventional radiography and CT, there may be spinal canal widening, posterior vertebral body scalloping, widened interpediculate distance with thinning of the pedicles, and scoliosis (though uncommon). 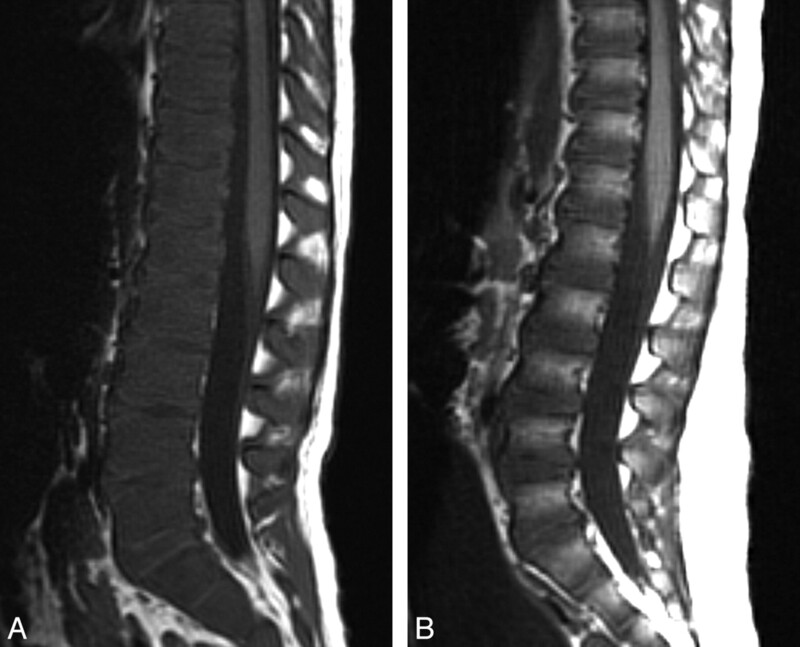 On MR imaging, ependymomas are T1 hypointense or isointense and T2 hyperintense with well-circumscribed lesions and are characterized by expansion of the spinal cord. Hemorrhage and cysts can be present. In ≤20% of cases, deposits of hemosiderin may be seen in the cranial and caudal margins of the lesion, a so-called “cap sign.”116 Cord edema can also be present. Enhancement of the solid component is usually intense and well-delineated. We thank Nancy Drinan for her editorial assistance and Cynthia Dubé for her assistance with manuscript preparation.